As Paul Kent, MD, sees it, patient Sam LiBassi has become something of a Rush ambassador. 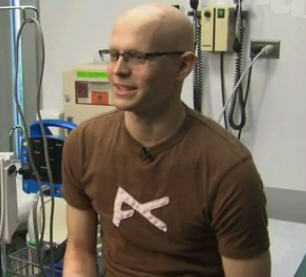 “He spends his time in the hospital making friends with the other patients, visiting them, making them laugh, making them smile,” says Kent, a pediatric oncologist at Rush University Medical Center, in an interview with WCIU. Twenty-three-year-old LiBassi, who’s being treated for cancer at Rush, says he didn’t have such a positive attitude at the outset. Fellow patient Katie Sanderson says LiBassi helps lift her spirits when she’s down. This entry was posted in Cancer, Children, Patient Stories, Rush University Cancer Center and tagged paul kent, pediatric cancer, sam libassi. Bookmark the permalink. is true that vitamin D can help make the cancer less brutal? I’m looking for this type of information, thanks for your response. This video is really inspiring! I wish Sam all the best! Thanks for sharing this.